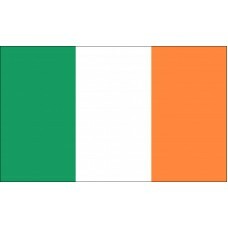 The Irish Flag features three vertical bands of, green, white, and orange. 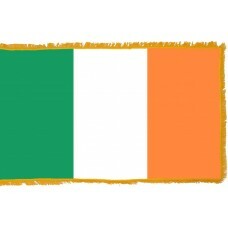 The orange color represents the Irish Protestants, the white color represents the peace between the Catholics and the Protestants (something that has caused many conflicts throughout the years) and the green color represents the Irish Catholics, the revolution, and the greenery of the country. The Irish Flag was officially adopted as the national flag on December 6th, 1921 but it was first introduced and flown on March 7th, 1848. It was first flown by a man named Thomas Francis Meagher who was a leader of the young Irelanders. Meagher was keen to create a "New Ireland" where the Catholics and the Protestants would unite in their fight for independence against the British. Following the 1848 revolution in Paris, Berlin, Vienna, Rome, Prague, and Budapest, Thomas Meagher, William Smith O'Brien and Richard O'Gorman went to congratulate the French on defeating King Louis Phillippe. Meagher found his inspiration from the Revolution to defeat the British Rule. While in France, a group of French women created the Irish Tricolor and presented it to Meagher who then proceeded to present it to the Irish Citizens whilst stating, "The White in the center signifies a lasting truce between the orange and the green and I trust that beneath its folds the hands of Irish Protestants and Irish Catholics, may they be clasped in generous and heroic brotherhood." The Irish Flag was first regarded as a national flag in 1916 when it was raised above Dublin's General Post Office by Gearoid O'Sullivan but was not officially adopted until 1921. Ireland is an island in Europe and in Irish, is referred to as "Eire." It is divided into two areas, which are Northern Ireland, which is part of the United Kingdom and Southern Ireland which covers approximately 85% of the total area. The capital city of Ireland is Dublin. Ireland is also referred to as the "Emerald Isle" due to its lush greenery. Ireland has been a target for many invasions throughout the years, mainly due to its location. In 1168, the British invaded by taking lands and made changes in the politics which created a lot of friction and conflict between the British and Irish. In 1495, during the rule of Henry VII, the British took control of the Irish Parliament and made an attempt to ruin the Roman Catholic Churches. By 1660, during Queen Elizabeth's reign all the lands were taken from the Irish and claimed by the British. The British governed Ireland until 1690, when they were defeated by Ireland and Ireland began to claim back what was theirs. They signed a treaty with London, which was rejected by Irish Protestants in Parliament. In 1801, the Irish Parliament was overthrown and Ireland became part of a new "United Kingdom of Great Britain and Ireland" until it sought its independence in 1922, following the Irish war of independence.